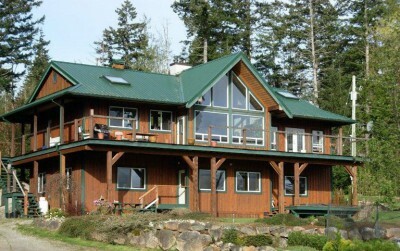 Reef Point Cottages is located along the Pacific Ocean, on the West Coast of Vancouver Island in Ucluelet, BC. The Vancouver Island waterfront vacation homes at Reef Point Cottages offer an exciting Ucluelet real estate opportunity. These two private waterfront cottages for sale are two bedroom, two bathroom homes with excellent rental revenue opportunities. These low maintenance 956 sq ft cottages are finished with teak, marble and slate flooring; granite countertops; pine wainscotting and ceilings. Cozy up to the fireplace on stormy nights or sit in your private hot tub on the oversized covered deck overlooking nature and on to Spring Cove. 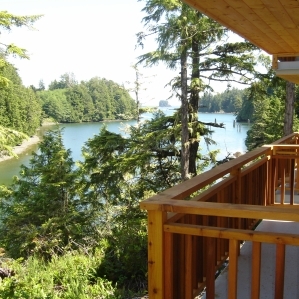 These Ucluelet vacation cottages for sale are part of the Reef Point Cottages rental program and the owner is entitled to 6 months personal use each year. The owners can also leave their vacation home in the rental program full-time and earn a return on this hassle free investment. Reef Point Cottages is located near Tofino, just minutes from Ucluelet’s beautiful pocket beaches or Long Beach in Pacific Rim National Park. The Wild Pacific Trail is on the doorstep of Reef Point Cottages. Unit 271 is priced at $299,000, and Unit 273 is d at $279,000. 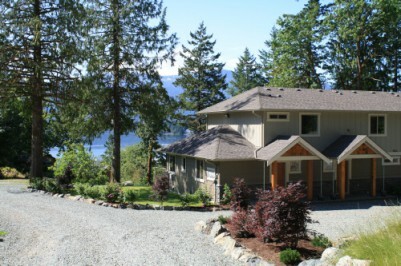 Enjoy the warm waters Sproat Lake this summer from your families own waterfront vacation home! The Maples Resort at Sproat Lake offers new Vancouver Island waterfront vacation homes at the popular Alberni Valley recreation area of Sproat Lake. Construction of Phase I is now complete and two units are still available, starting from $349,900. 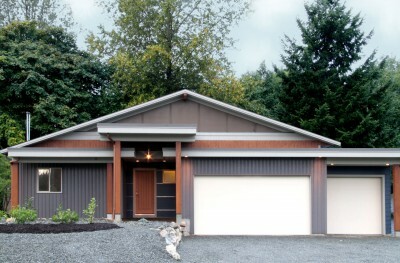 These new vacation homes are comfortably spaced around a naturally landscaped five-acre property wet of Port Alberni. Privacy is provided by tree buffers around the property and landscaping, which makes extensive use of native vegetation. The property slopes upwards from the beach providing each new vacation home unit with water views. Buildings are West Coast Contemporary style and each home offers spacious, sunny decks with southern exposure. Owners at The Maples enjoy a large beach area and a 2,100 sq ft dock complete with a boat slip. Lake access is provided by roads and trails leading to the beach. The Maples is a phased development of 24 strata titled water front units on Sproat Lake. Designated as seasonal recreational use, any person may occupy these homes for up to 180 days per year, but they are not intended to be a full year permanent residence. Vacation homes at the Maples at Sproat Lake start at $349,900 for full ownership. 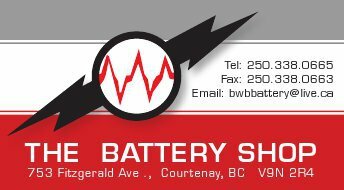 The Battery Shop is Vancouver Island’s one stop shop for batteries and battery services. The Battery Shop in Courtenay sells batteries of all styles – from camera batteries to RV and golf cart batteries. The Battery Shop also repairs and rebuilds specialty batteries for construction tools, home appliances, specialized trades equipment, security systems and more. The Battery Shop has the equipment and expertise to create custom batteries. They also offer a battery recycling service for the Comox Valley. Call The Battery Shop at 250.338.0665. Imagine entertaining on your spacious ocean view patio at The Gales in Ladysmith this summer. These new patio homes and condominiums offer spectacular Vancouver Island ocean views, both through the oversized windows and from their expansive balconies and patios. Enjoy the dramatic, ever-changing outdoor scenery from the comfort of your spacious living room, or step outside to enjoy West Coast living at its finest all summer long. The Gales features 68 new homes - 42 patio homes and 26 condominiums. Inspiring features include vaulted ceilings, spacious rooms, top-quality finishing and amazing attention to detail. Homes are designed and built in West Coast contemporary architectural style and floor plans are open, ideal for entertaining. 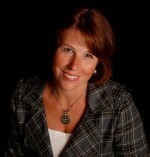 Comox Valley Realtor Tina Vincent PREC specializes in relocations to the Comox Valley. Realtor Tina Vincent is "Your Comox Valley Connection" for Military postings, RCMP transfers, corporate and employee moves and more. She is a Brookfield Relocation agent on Vancouver Island, serving the Courtenay, Comox and Cumberland, BC areas. Realtor Tina Vincent combines traditional real estate services for home buyers and sellers with modern, innovative marketing. A realtor with Royal LePage in the Comox Valley, Vancouver Island, Tina works to find the right residences for her clients, ensuring that families find not just houses, but homes. 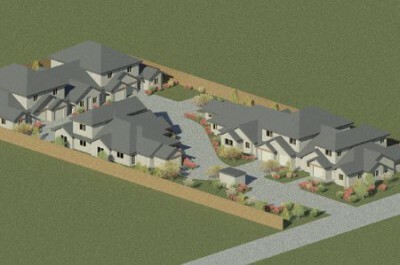 A new townhome development is currently under construction on Piercy Avenue in Courtenay on Vancouver Island. This centrally located new real estate project is being built by McQueen Construction. The development will feature ten new homes in four-plexes and one duplex. So far, building permits have been issued in the amount of $1.4 million for two four-plexes. The homes will be built in two buildings with four linked townhouses; two additional townhouses will also be added. These new Courtenay town homes will be completed this summer. Floor plans will include two or three bedrooms and will range in size from 1,300 to 1,600 sq. ft.
All of these new homes will feature hardwood flooring, solid wood cabinets, and come complete with appliance packages. The homes will have attached garages and additional driveway parking, and the development will also have guest parking spots. Located only a few blocks from downtown Courtenay, Piercy Avenue Townhomes are set in a sunny, central location in this growing Vancouver Island city. Prices are expected to start at $249,900. Congratulations to Fairwinds, which was recently named a finalist for the Greater Nanaimo Chamber of Commerce Sterling Awards, in the Community Spirit category. The Fairwinds Development was nominated based on work they do with local community organizations and charities. Earlier this spring, Fairwinds undertook a collaborative video project with two students from the Digital Media Studies Department at Vancouver Island University to highlight some of the community groups and charities that they support. Learn more about these groups by watching the video here. The Fairwinds real estate development features a variety of homes and lots for sale, many with ocean and golf course views. The lots at Bonnington Ridge offer both. Set in a quiet cul-de-sac, Conveniently located near the Fairwinds Centre, the residential lots for sale at Bonnington Ridge range from .31 - .88 of an acre and start at $209,000. An additional lot at Bonnington Heights is now available for $159,000. 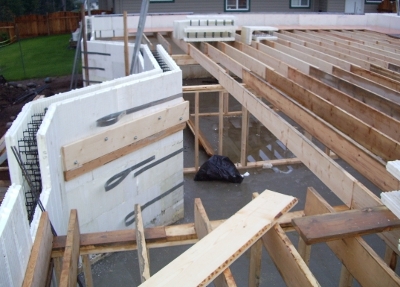 Nutmeg Homes is a Vancouver Island-based builder of Insulated Concrete Forms homes. 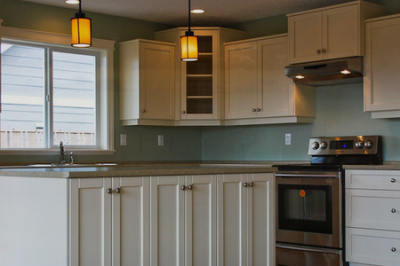 Nutmeg Homes of Courtenay are custom home builders who strive to continually improve their product, with energy efficient and eco-friendly products. 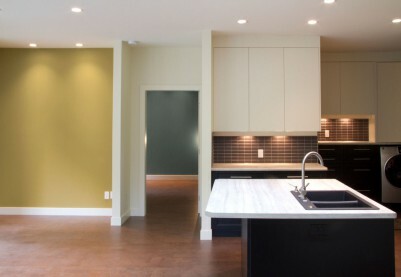 An ICF home by Nutmeg Homes uses up to 40% less energy than the average new home in B.C. Insulated Concrete Forms or ICFs are hollow foam blocks or panels, which are stacked to form the walls of the home. The forms are filled with steel-reinforced concrete to create a solid structure. The resulting walls offer solid construction that provides a draft-free, quiet, healthy and comfortable living environment. Nutmeg Homes is also exploring the options for building Living Roofs for residential homes in B.C., after the successful completion of a green roof on a Comox Valley commercial building. For more information on Nutmeg Homes and their ICF construction process, visit their website. Design-Build is a unique delivery model for construction. In the Comox Valley, Capstone Dwellings is one of very few home builders who adopts this specialized method with dedication to professional design-build standards. Firstly, all projects are comprised of two phases. 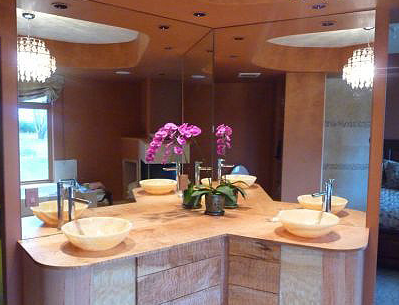 In the design phase clients are taken through the home design process based on their individual needs. Custom design can be completed in as little as three months. Alternatively, clients of Capstone Dwellings can choose to purchase homes plans by an approved outside home plans company and have changes made to meet needs. With Capstone Dwellings Design-Build, projects also include cost planning. The term “cost planning” refers to a professional service where the project is carefully budgeted. In professional “cost planning” there are no rough estimates. Whenever possible, quotes are used to derive an end price that is as close to the full project scope as possible. When needed, the home design staff at Capstone Dwellings can modify the plans and change details to bring the budget to the desired outcome. The build phase of the project is initiated once the plans are ready for engineering (if needed) and permitting. Capstone Dwellings handles the permit process on behalf of their clients. Currently the permitting wait for the Town of Comox, City of Courtenay and Comox Valley Regional District is approximately three and a half weeks. During the project modern technology is used to provide full financial disclosure on project costs. All trade discounts and special materials rates are passed onto the Clients so that everyone knows how the project funds are being used. Changes to design, scope and products can be made during the project and with the open financial details, clients can make those decisions with a better sense of overall impact on their budget. To further give the business a competitive edge, Capstone Dwellings design fees are currently set at a competitive $50/hour and general contracting fees meet standards for the local general contracting industry. Design, Management, Admin and Building staff at Capstone Dwellings are all experienced and qualified. Capstone Dwellings Design-Build focuses on contemporary or modern west-coast design and believes in smarter housing in use of space and materials. They are located in Courtenay's vibrant Tin Town (south entrance) at 2448 Cousins Ave. Step into casual elegance at Nanaimo’s newest luxury ocean view residences, the condominiums at Boardwalk Place. Set in the historical Newcastle neighborhood of Brechin Hill, steps from the Nanaimo Yacht Club, Boardwalk Place presents a lifestyle opportunity in a spectacular ocean front community. Offering the highest standard of steel and concrete construction, Boardwalk Place presents some of the best value in the Vancouver Island real estate market today. These new Vancouver Island ocean view homes have been designed to take advantages location, with expansive windows capturing dazzling views of the water, city, marina and more. Large private balconies and/or ground floor patios offer space for relaxing and taking in the views. 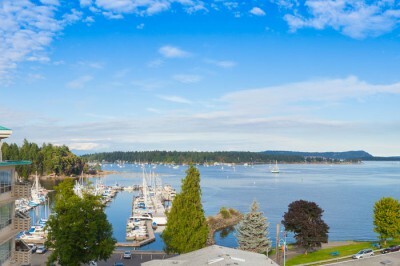 Nanaimo's newest ocean view townhomes and condos feature refined West Coast architectural design. Residents will enjoy peaceful courtyard gardens and spectacular ocean views from a fully-furnished entertainment roof top deck. These ocean view condos and townhomes start at only $238,888. For detailed pricing, visit the Boardwalk Place presentation centre at 370 Stewart Avenue, Nanaimo, open Monday-Friday from 1-4p.m. and Saturday and Sunday from 1-5 p.m.
AA Mini Storage in Nanaimo offers the first month free for any storage rentals of two or more months, paid in advance. Nanaimo's AA Mini Storage features business and household self storage options, including vehicle and RV storage, heated units and drive-up storage units. These Nanaimo self storage rental units range from 5x5x5 to 20x30. AA Mini Storage has units for all of your self storage needs – from storing business equipment to the contents of a house. AA Mini Storage offers excellent security, with video surveillance, gated access, and resident managers on site. AA Mini Storage offers convenience as well – open 7 days a week and with drive-up doors available on 10x10x10 units and larger, your storage locker is always easily accessible. Contact AA Mini Storage at 250.758.7442. With spring weather finally upon us, it is time to plan exterior cleaning and painting. Rent a power washer with attachments for driveways, patios and siding, and then finish with painting the fence, deck, or the trim of your house. Home Hardware Building Centre's Central Rentals is ready to help you get the job done. Courtenay's Home Hardware Building Centre's Central Rentals offers equipment rentals in the Comox Valley. Central Rentals offers all the tools and equipment to get any Comox Valley project done right and renting means you'll always the right tool for the job. For larger project, Central Rentals' Comox Valley equipment rentals division can supply: mini excavators; bobcats; scaffolding, construction security fencing; jack hammers; compactors; floor sanders; laser levels, and more. Central Rentals in the Comox Valley offers rates from half-day up to long term on equipment rentals. Offering unmatched service and selection, Central Rentals is ready to help homeowners and contractors find the equipment they need. I have just returned from spending a wonderful weekend on Quadra Island, located only a 10 minute ferry ride from Campbell River, on Vancouver Island. Our group stayed at April Point, a beautiful resort, located on the oceanfront overlooking Discovery Passage. One of the highlights of my trip was visiting a custom built ocean view home for sale, located in Heriot Bay, overlooking Rebecca Spit and Drew Harbour. The property contains the main home and a second home (a carriage house). The main home faces, for stunning sunrise views from the kitchen, living room, and master bedroom on the upper level. The same ocean views are available from the main floor as well. One of the main features of this home is a floor-to-ceiling rock fireplace in the main living room which can be seen from the open concept kitchen and dining area. The main home has a cozy feel to it, because of its design, and contains 3,200 sq. ft. of living space. I really liked the 1500 sq. ft. wrap-around deck on the upper floor, which provides lots of space to enjoy outdoor living in the warmer months of the year. This property offers great value, with two homes beautifully situated on 1.4 acres on one of the most scenic, ocean view properties on Quadra Island, a piece of paradise, located only 15 minutes from Vancouver Island. Price is $799,000. For more information, contact custom home builder Tamarack Construction at 250.203.1979 or email tamarack@gicable.com. 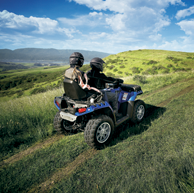 Western One Rentals and Sales, a full service for equipment rentals and sales shop on Vancouver Island , is now also North Vancouver Island’s only authorized Polaris ATV and Ranger/RZR Utility Vehicles dealer, located in the Comox Valley. Serving Courtenay, Campbell River, Port Alberni, the North Island and the Sunshine Coast. WesternOne is the place to buy Canada’s number one selling ATV. Western One also has Polaris factory-trained and certified technicians who can take care of your ATV parts and servicing needs. As Vancouver Island’s only Ranger/RZR dealer, WesternOne is committed to providing the same great customer service for their ATV sales and service as they do for their Comox Valley equipment rentals. WesternOne Rentals and Sales also rents, sells and services scissor lifts and aerial lifts; generators; air tools; concrete equipment; forklifts and much more on Vancouver Island. 1stView.ca has been nominated for a West Coast Social Media Award as Most Innovative Social Media Product or Technology. As well, our sister site, the ClariceCoty.com blog has been nominated as Best Business Blog. The winners will be selected by a judging panel from among the top vote getters in the initial round. Please help us become finalists by voting. You can vote once a day, every day until voting closes at noon on May 14. Awards will be presented during the 2012 Social Media Camp in Victoria. Please vote for ClariceCoty.com as Best Business Blog and 1stView.ca as Most Innovative Social Media Product or Technology. Spring is well on its way and its time to get started on those landscaping projects. Banner Landscaping in the Comox Valley specializes in complete landscaping installations for commercial developments and for new homes in Comox, Courtenay and the Comox Valley. Banner Landscaping has bobcats, excavators and all of the equipment needed to complete any landscaping project. Banner Landscaping can install paving stones and retaining walls, or a complete landscaping project with irrigation and water features. Banner Landscaping's Comox Valley crew is courteous and knowledgeable and will ensure that you have an outdoor space to be proud of. Give them a call at 250.792.1835. Trent River Estates in the Comox Valley consists of 11 residential estate lots, ranging in size from 1.33 to 2.71 acres. 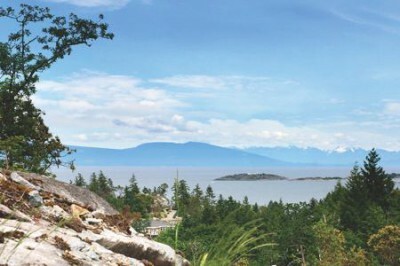 This desirable subdivision is located in Royston on Vancouver Island, and there are only seven lots remain for sale. The first new homes in the development are now being built. 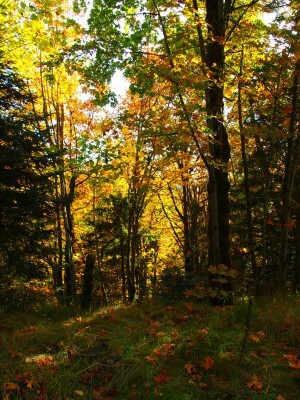 Trent River Estates is situated amid the green space and woodlands, with 8 lots backing onto the Trent River. Three lots feature panoramic Comox Valley mountain views. A building scheme is in place and the zoning on these Vancouver Island building lots allow for carriage homes. The development features underground services, and each residential lot has an approved septic area. The Island Highway is easily accessed from Trent River Estates and the properties are only minutes from golfing, boating, hiking and shopping in the Comox Valley. Available lots start at $249,700. For information about other residential lots for sale in the Comox Valley, see our real current real estate projects. For Sound Security call the experts. 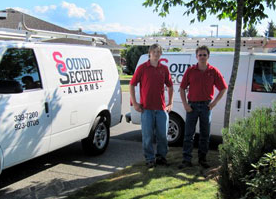 Sound Security in the Comox Valley offers security systems and much more for homes and businesses. Sound Security’s expert installation team provide surveillance cameras, sound system equipment and wiring, home theatre installations, and multi-room music systems. The can install media panels and offer new home installation packages. As the only provider of screen alarms on Vancouver Island, Sound Security can offer a security alarm option to keep intruders out but let fresh air in. They will install, service and monitor security systems to protect your home, family or business. Since 1982 Comox Valley Glass & Mirror has been helping builders and homeowners in the Comox Valley with all of their glass needs. Specializing in custom shower glass enclosures and doors, and steam showers, as well as specialty mirrors and other custom work, Comox Valley Glass & Mirror has created luxury pieces for many Vancouver Island homes. They can create accessible showers, heavy glass railings and other custom work. Comox Valley Glass is a full service glass shop, which also offers new and replacement windows, sealed units, storefronts and commercial displays, mirrors, shelves and table-tops, and glass of all types. In addition, they sell retractable Mirage screen doors. Stop by their showroom at 2060 Guthrie Road in Comox, or call them at 250.339.7966.